I first tried the 17 Day Diet in 2010. It's actually the only time I've ever followed a weight loss program, and it worked. I read the book, stuck to the guidelines, and lost around 11 pounds (5 kilos) in just over 2 weeks. I was attracted to this particular diet because it allowed me to eat a healthy variety of food, there's no calorie counting or weighing of ingredients, and there are certain foods that you're allowed to eat in unlimited quantities. I basically wasn't afraid of being starved. After my recent 10 week break from alcohol, during which time I didn't lose as much weight as I had hoped, I decided to extend my alcohol abstinence for a few more weeks and try the 17 day again... 7 years after my first attempt! This diet is based on a low carbohydrate, high protein diet, with a focus on improving the heath of your gut. You can eat unlimited amounts of approved lean proteins and 'cleansing vegetables', along with 2 servings of low-sugar fruit before 2pm, and 2 servings of probiotic food each day, for 17 days. While some foods are allowed in unlimited quantities, the book urges you to pay attention to feelings of hunger and fullness. You should eat when you're hungry and not allow yourself to get to the point of starving, and you should stop eating as soon as your stomach feels comfortably full, before you feel stuffed. Alcohol is banned, as are all other carbohydrates like pasta, rice, bread, and potatoes. You need to drink at least 8 glasses of water a day, and drinking green tea is encouraged for it's metabolic benefits. Black coffee is allowed on the diet (phew!) but it doesn't count towards your daily water intake. Unlimited 'cleansing vegetables' including asparagus, broccoli, brussels sprouts, cabbage, carrots, cauliflower, celery, cucumbers, green beans, green leafy vegetables, lettuces, mushrooms, peppers, spinach, and tomatoes. Unlimited skinless, lean protein including chicken or turkey breasts, salmon, white fish, and tinned tuna. You're also allowed up to 2 whole eggs, or 4 egg whites per day. 2 servings of low-sugar fruit including apples, all types of berries, grapefruit, oranges, peaches, pears, plums, prunes, and red grapes. 2 servings of probiotic food including low-fat yogurt, kefir, semi-skimmed acidophilus milk, yakult, cottage cheese, reduced salt miso, tempeh, sauerkraut, and kimchi. 1-2 tablespoons of healthy fat including olive oil and linseed (flaxseed) oil. At least 8 glasses of water and lots of additional green tea. Condiments and seasonings in moderation to add flavor to your food including salsa, low-carb tomato-based pasta sauce, light soy sauce, low-carb tomato ketchup, fat-free soured cream, low-fat low-sodium broth, Truvia or Nectresse (non-caloric sweeteners made from natural ingredients), sugar-free jams and preserves, vegetable cooking spray, fat-free cheeses, fat-free salad dressing, salt, pepper, vinegar, mustard, and herbs and spices. 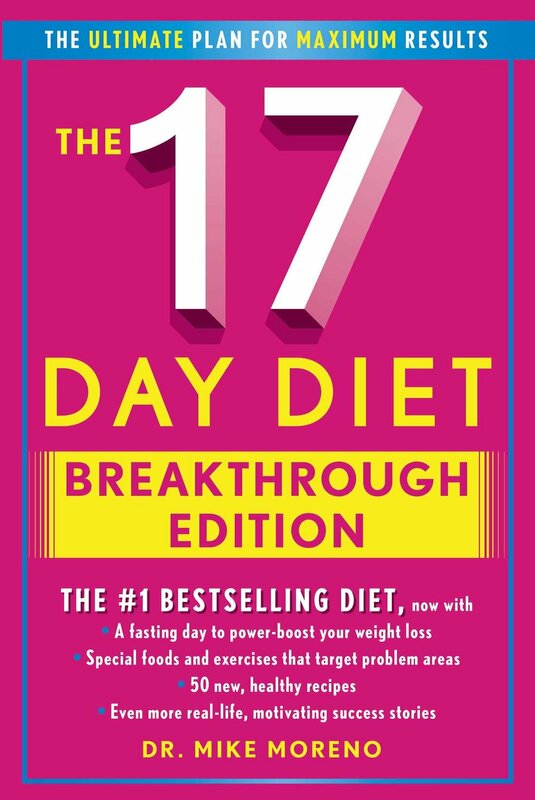 The 17 Day Diet book is written by a family doctor, and includes plenty of science to support the structure of the diet, along with interesting studies on the impact of sugar, the benefits of green tea, and so on. I found it to be a really compelling read, and I'm absolutely convinced that reading the book helped me stick to the diet. Having originally done the diet 7 years ago, I needed a refresher and have reread the latest version of the book. If you're interested in trying the program, I'd highly recommend reading the whole book - unless you're innately disciplined and don't need the extra push of motivation (unlike me) and then you could just follow my outline as it's written here. For anyone keen to shed a few pounds, I thought it might be interesting for me to keep a detailed food diary for the duration of the diet. I'll record it all on the blog, along with my weight daily, and bust/waist/hip measurements at the beginning and end of the diet. It will be interesting to see if the diet is as effective for me now as it was 7 years ago. Egg drop soup; my go-to detox soup that's packed with 28 gram of protein and only 155 calories. 10 things I've learned from going alcohol-free for 10 weeks. Banana and almond pancakes. 100% guilt, gluten, and dairy free!